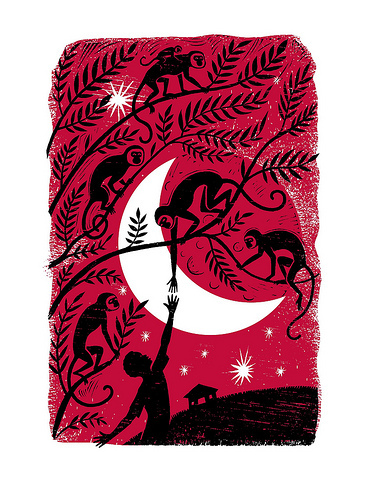 There are so many reasons why I am just over-the-moon with excitement for Alexander McCall Smith's newest series of books for children, and not one of them is because I am a fan of his adult novels. I've never read any of his No. 1 Ladies Detective Agency novels, of which the adult Precious Ramotswe is the star, nor have I read any of his many books for children. I am bursting with elation for The Great Cake Mystery: Precious Ramotswe's Very First Case for even better reasons. First off, this book is a much needed infusion of new life (long life, I hope) to a class of books that is ruled by Junie B Jones and The Magic Tree House, with other (mostly copy-cat) series struggling to stay on the shelf long enough to build an audience. Secondly, outside of Cam Jansen and Nancy Drew, there are very few girl detectives in kid's books, or any kind of detective for that matter. To have a girl detective as the main character of a second grade level reading book is fantastic! 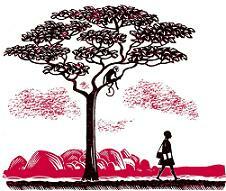 Furthermore, Precious Ramotswe is NOT white. I was so excited about the setting for the book and the way that the main character realistically went about solving the mystery while also being a genuinely thoughtful and caring person that it was not until I was reminded of the significance of her skin color while reading Betsy Bird's review that I remembered how few non-caucasion characters there are on the shelves of the chapter book section at the bookstore where I work. 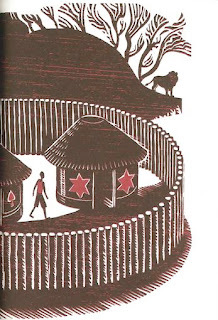 Finally, The Great Cake Mystery: Precious Ramotswe's Very First Case stands out among other chapter books because of the gorgeous, spectacular, utterly out of the ordinary (for a beginning reader chapter book) illustrations on almost every page by Iain McIntosh. As I read, I couldn't wait to turn the page to see what would be depicted next. 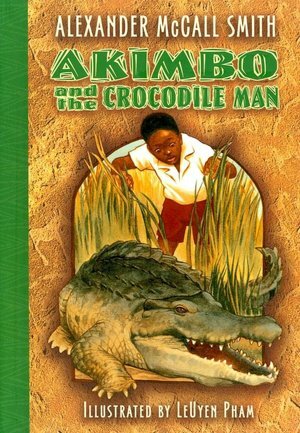 Although I just classified The Great Cake Mystery: Precious Ramotswe's Very First Case as a second grade level book, I think that an ambitious first grader could definitely give it a go and this is yet another reason I love this book. Many of the second grade level books in the chapter book section are written at a second grade and higher reading level while there are very few written at a slightly lower level, which is a HUGE market if any writers out there are reading this! Aside from Megan McDonald's invaluable Stink series, Kate DiCammillo's Mercy Watson series and Dav Pilkey's Ricky Ricotta's Mighty Robot series, there is not much going on for readers who aren't quite ready for Junie B Jones and The Magic Tree House. With pictures on almost every page and a slow paced, explanatory style of writing, The Great Cake Mystery: Precious Ramotswe's Very First Case is perfect for emerging readers. 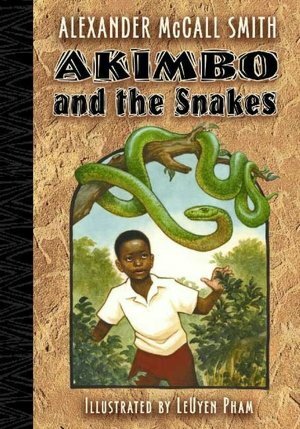 Adding to this wonderful aspect is the phonetic spelling of the names of some of the characters within the story itself, as well as a bonus section at the end of the book that includes a note from the author, a character guide with additional pronunciation tips, a page on the geography and people of Botswana, a reader's guide, a list of curriculum connections and, best of all, a recipe for "Precious' Sponge Cake Worth Stealing." McCall Smith begins his book, "Have you ever said to yourself, Wouldn't it be nice to be a detective? Most of us will never have the chance to make that dream come true. Detectives, you see, are born that way. Right from the beginning they just know that this is what they want to be. An right from the beginning they show that solving mysteries is something they can do rather well. This is a story about a girl who became a detective. Her name was Precious." 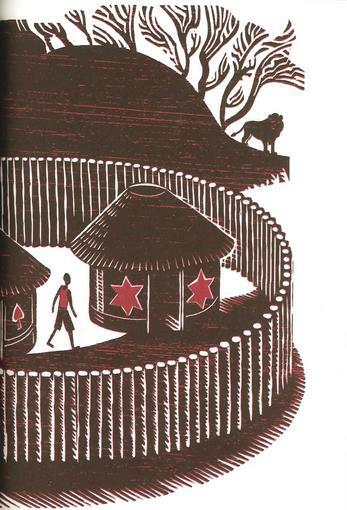 The rest of chapter 1 and chapter 2 are taken up with a brief description of Botswana, the country Precious lives in and the telling of a bedtime story, her favorite, in which her father, Obed, describes his face-to-face encounter with a lion in the night while visiting his cousins. It is Precious' favorite story and she has heard it often. As Bird points out, this bedtime story has no bearing on the rest of the book, but "it's so enjoyable I'm glad it's there even if it's utterly superfluous." I couldn't agree more. 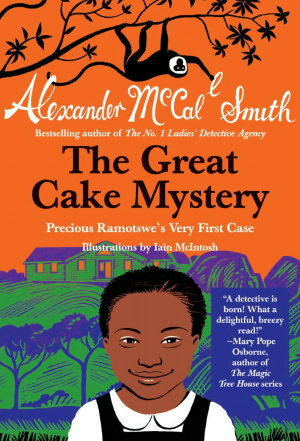 As I read The Great Cake Mystery: Precious Ramotswe's Very First Case everything about it was so new and interesting that I never even noticed that this story did not relate to the rest of the book. Actually, I thought that maybe the telling of her father's stories was something important from the adult books that had a bearing on her character and might be repeated as the start of every book in what I hope will be a long series. Also, the telling of the story allows for a scene in which Precious, internally, questions the veracity of her father's insistence that a lion will get indigestion if he eats an angry person. She then tells her father that she doesn't believe him. To this Obed responds, "You can tell when people are making things up, can't you? Perhaps you will become a detective one day." Precious thinks this is a strange idea at first, comes to like it, saying, "Surely it will be years and years before I get my a case." She was wrong about that. When the sweet treats from students' lunches go missing, they accuse a fellow student. Precious knows they are wrong and sets her mind to solving the mystery, which is pretty basic. However, the descriptions of Precious' school and its surroundings are entrhalling. There is Big Mrs Molipi, the school cook who prepares a "sort of paste made of corn" and green peas and mashed turnips every day because she thought it was healthy and her deferential assistant and cousin, Not-So-Big Mrs Molipi. There is an illustration that makes the names of these two very clear. Then there is the dream that Precious has that helps her crack the case and the very funny and creative way she goes about proving Poloko's innocence. It turns out that Precious' mother is dead and her father is not such a good cook. Using a "well-tried recipe for sponge cake" along with a secret ingredient, Precious sets a trap and at the same time makes a new friend in Poloko who suggests the name for Precious' future detective agency when he tastes her (non-booby-trapped) sponge cake declaring it to be, "First-class, number one cake." The last lines of the book read, "When I have a detective agency, I'll call it the No. 1 Ladies' Detective Agency. Many years later, she did just that." As Bird points out, the majority of young readers will know nothing about McCall Smith's mystery series for adults, but that they will definitely enjoy seeing the how the seed of an idea is placed in Precious' mind, how it takes root and grows and, by the end of the book I am sure they will be thrilled to know that Precious really does grow up to be a detective with her own agency. How many chapter books for kids refer to the future adult lives of their main characters? I think that this grounds the book in reality for readers while at the same time giving them something to look forward to in books to come. 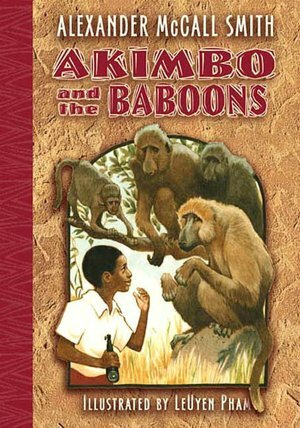 In 2005, this trio of books written at a true second grade reading level features ten-year old Akimbo, who's father works as a park ranger.